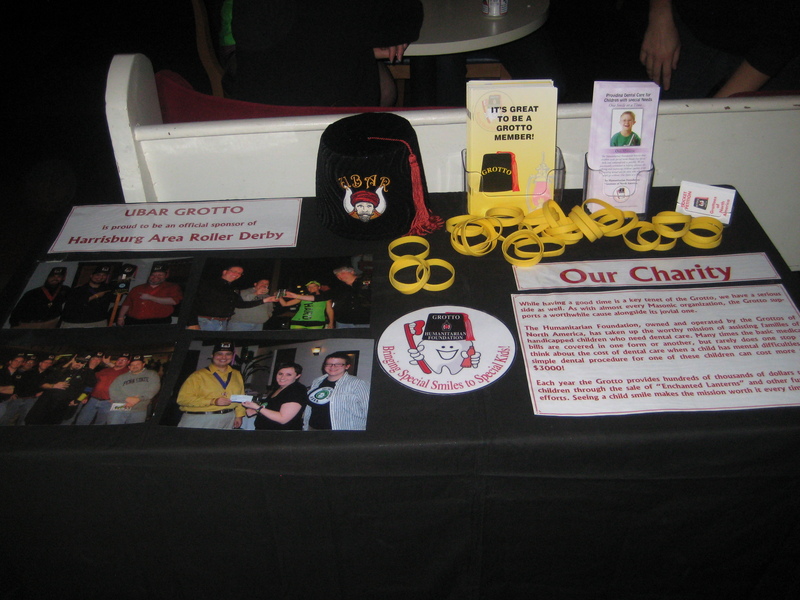 On Sunday, November 27, 2011, representatives of Ubar Grotto attended Harrisburg Area Roller Derby’s end of the year party. The event was held at the Harrisburg Mid-town Arts Center in Harrisburg, PA. The program was a fundraiser / awards ceremony / dance party for the Roller Girls, their friends, and fans. Ubar was invited to set up a table so that the two groups could get to know each other better during the evening. Beginning at 6 PM, the bar opened and the crowd gathered to bid on a plethora of silent auction items ranging from Coach handbags, to original pieces of art, and of course the Skull and Crossbones Fez from Fez-o-rama (which was donated by Ubar.) Bidding on all the items was hot and heavy, with several bidding wars taking place. All of the auction proceeds went to HARD to help fund their program. The fez was an especially popular item, having roughly 10 bids throughout the night. It finally went for $41! 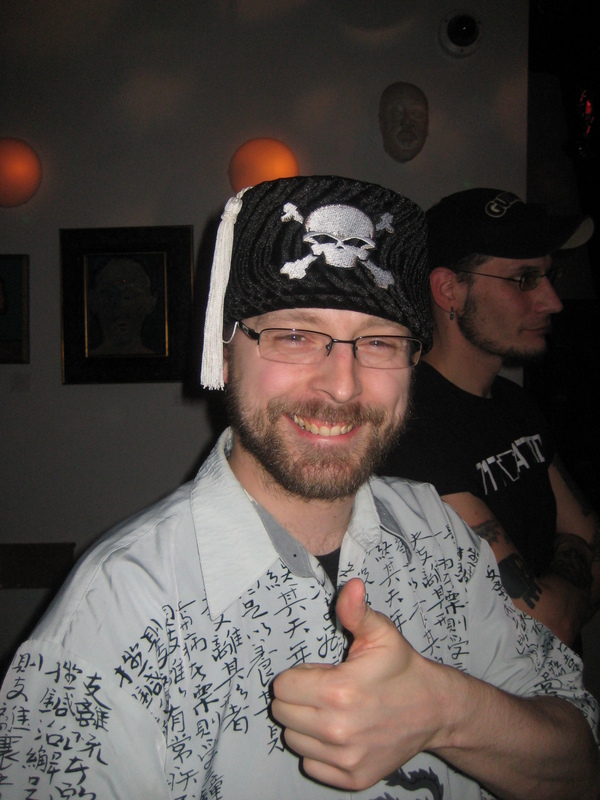 The winner of the item was the aptly named “Stat in the Hat,” who serves as a statistician for HARD. Upon receiving his fez, he immediately placed it over his famous drover style hat to find that it was a perfect fit. Next time you’re at a HARD bout, make sure to check out Stat’s new hat! Congrats to Stat and we’re sure the girls appreciate the support! Not to be outdone, Ubar did some bidding as well, winning one item of particular note. The announcer for HARD, “Max the Axe,” became well known for his signature blazer, with lime green lapels, diamond studs, and specially made pocket flaps. 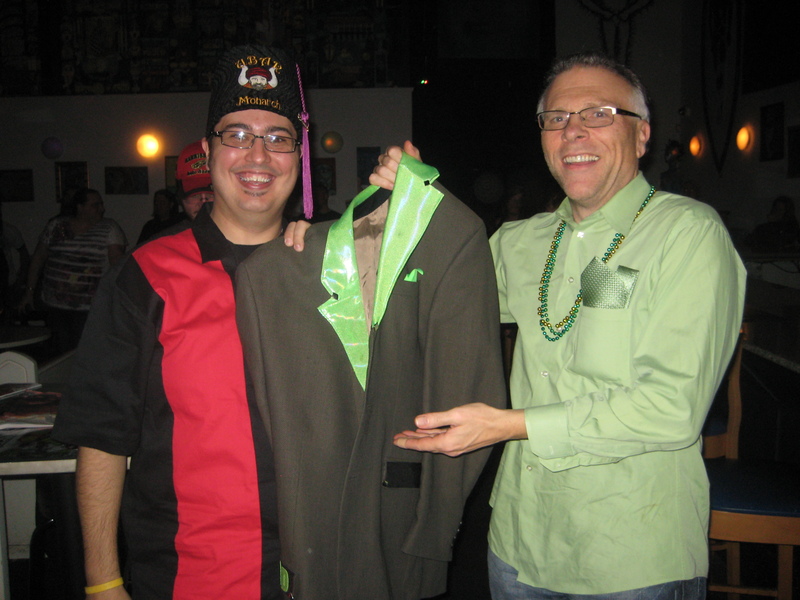 Max graciously donated his jacket to the auction, which immediately caught the eye of the Monarch. Having only placed one bid on the coat, he was surprised to find that he was the high bidder at the end of the evening! The plan is to create a Mokanna out of lime green rhinestones on the back of the jacket and have Ubar members wear it to HARD events. When Max presented the Monarch the jacket it was described as being like the presentation of the blazer at the PGA Masters – and we couldn’t agree more! Thank you to Max for donating his blazer – it has gone to a good home! As usual, Ubar came to party as well. The Prophets made their presence known as they socialized with the gals and talked to friends – old and new alike. The crowd learned what Grotto was really about when Pro. Brent Richards took the microphone and delivered an outstanding rendition of Katy Perry’s hit single “Teenage Dream.” Brent also regaled the crowd with a rendition of “Mack the Knife” and Billy Joel’s “Piano Man,” which was sang as a duet with Pro. Seth Anthony. Now, we know that you are beating yourself up for missing this, but fear not! Videos of Pro. Richards have been posted at the Ubar Facebook. Check them out! It was a fantastic evening of drinks and friends. Ubar is so happy and proud to be a part of the HARD family and we can’t wait until the next bout. Thanks again girls!